What Is a Predictive Index Test? Predictive Index is a company that makes a variety of tests. The two main ones are the Predictive Index Cognitive Assessment or PICA (also known as the Predictive Index Learning Indicator or PILI, and previously as the Professional Learning Indicator or PLI) and the Predictive Index Behavioral Assessment or PIBA. The PICA test is a cognitive ability test, while the PIBA is a personality test. Both are used by many corporations in their recruitment processes. The stated aim of the PICA test is to use “objective measures of both the job and the candidate” so as to avoid unconscious biases in the hiring process. The PICA test is seen as a strong indicator of future job performance and many employers put great stock in its results. The PIBA, on the other hand, “identifies and categorizes workplace motivating drives to provide deep insights into the behaviors and motivations of your colleagues and employees”. It is a personality test that scores you in four categories: dominance, extroversion, patience and formality. 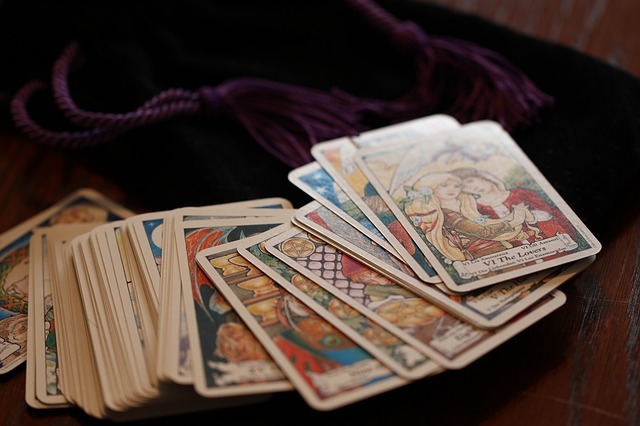 When Are You Likely to Take a Predictive Index Test? What Does a Predictive Index Test Aim to Measure? Typically you’ll take the test early on in the recruitment process, though this can vary from employer to employer. Predictive Index tests are designed to be far-reaching and easy to distribute, so as to cut a large candidate pool down to size. They can also be used before or during an interview, or just before you receive a job offer. In some cases employees are assessed while in work. Predictive Index tests are primarily used for graduate-level roles but can also be used at a more senior level. The PICA test has a similar aim to most IQ tests, and is intended to make an unbiased assessment of someone’s cognitive ability. On these kinds of tests, your abstract intelligence is evaluated. The PIBA aims to see how you fit into the workplace from a cultural perspective. It determines what kind of person you are, so that the employer can consider whether or not you’ll be a good fit for their team. On this test you will answer 50 questions in 12 minutes, which is an average of a little over four questions per minute. Each answer is worth one point, meaning a 100% score is 50. It’s this time limit that most people struggle with, so it pays to be well practiced. If you know the format and what to expect, you won’t waste any time working out what it is you’re looking at. The key with these questions is to not be afraid of the “cannot be determined” answer. Many people ignore it because it can be more difficult to say for sure whether something cannot be determined. It’s just as likely to appear as the other two answers, so don’t discount it. The correct answer is: C). 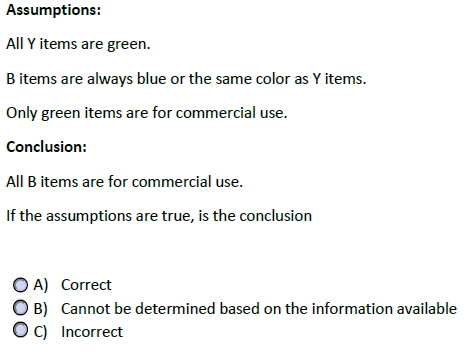 According to the assumption, B items can be blue or green. However, only green items are for commercial use. The conclusion that "all B items are for commercial use" is therefore incorrect. You might also encounter other kinds of language questions. These rely more on basic vocabulary, so the best way to practice is to read and expand your vocabulary. Most of these should be relatively easy, but, again, the difficulty is time. Practice them and you’ll be much faster. These questions will have you working with numbers and performing mathematical calculations to arrive at an answer. 1. The first kind are the straightforward math questions. For example, here you need to work out what number the sums represent and then compare them. For this question you will need to convert each fraction to its lowest common denominator, then subtract the second fraction as necessary. So, you can see that the smallest fraction is D). Remember, you are not allowed a calculator in this test, so you’ll need to practice your mental arithmetic. 2. The second kind involves numerical patterns. The two stages to a question like this are to first work out the pattern and second, to extrapolate the pattern to work out which comes next. What is the next number in the sequence below? In this case, the pattern is to double the number and add 4, which means that the correct answer is: A) 124. 3. The third kind are math problems disguised as word problems. You have been asked to wrap 150 presents for the lucky dip at your local school fair. You plan to finish wrapping 50% of them over the next 5 days. If you plan to wrap 1/5 of those every day, how many will you wrap each day? These questions are based on abstract patterns of shapes and lines, and require the candidate to work out what comes next. To answer this question, identify the repeating pattern. In this case, the first picture shows an upward pointing arrow; in the second picture another arrow head has been added to the bottom of the shaft. For the third image a second upward arrow has been added; the fourth image has a further arrow head added to the bottom of the shaft. It follows logically that the correct answer would show a new arrow being added to the ones in image four. Therefore, the only logical answer is B. Because we’re often not used to thinking about abstract patterns like these, they usually require the most practice. The test itself is untimed but generally takes around 5 to 10 minutes. There are two stages to the test. First, you will face a list of 86 adjectives and will be asked to select which of these you believe reflect your behavior. On the second page, you will have the same list of adjectives, but this time you must check them in accordance with how you believe others perceive you. These adjectives could include words such as helpful, relaxed or passive. 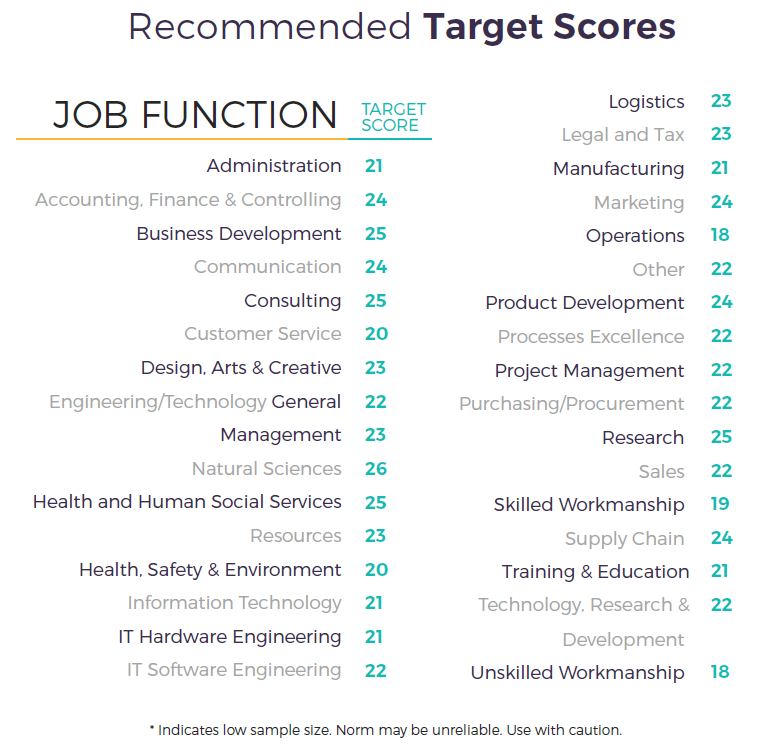 Predictive Index offers a table of scores you should aim for by the type of role. These are not pass or fail scores, but a measure of how likely a candidate is to be successful in a certain industry. The various scores out of 50 give you a ballpark for what you need to aim for. Predictive Index recommends that you add 2 to your target score to be very competitive, as the target score plus 2 constitutes a “100% cognitive fit” for the role. It’s useful to bear these numbers in mind while you practice for your test. If you are scoring well below the target score, then you know your application is unlikely to be competitive if you don’t get some solid practice in. The behavioral test scores you in a different way to the cognitive test. Rather than right or wrong answers, your answers build up a picture of you based on four traits: dominance, extroversion, patience and formality. As such, you’ll need to practice for it a bit differently. It’s not about getting the answers right, it’s about figuring out what the company will want from their candidates. Don’t use that information to lie about yourself – ultimately, there is no right or wrong answer – but perhaps use it to inform your opinion on the traits that you see in yourself. You cannot learn tricks and techniques for these kinds of test, so it's important to practice to improve your scores. As Predictive Index tests are frequently used as a way for employers to cut down a large group of applicants, not getting a high enough score can mean your application is simply rejected. So, how should you prepare? Do your research. Since you’re reading this article, you’ve already started. But it doesn’t end here. Read more. Learn more. For the PIBA test, research the company you are applying for and identify within yourself the traits they might be looking for. Take practice tests. The next step is to dive right in. Take some practice tests (eg those from rel="nofollow"JobTestPrep) and stick to the time limit. This will give you a really good idea of where your baseline is. How many questions are you getting right on average? Are you within the time limit? You’ll never be able to emulate the real pressure from the real test, but even an approximation helps. Review your tests. The best way to get better is to see where you went right and wrong, so that you can do some more targeted practice later. Start with the answers you got wrong. Be honest with yourself as to why. Were you unfamiliar with the format? Did the time make you rush and make a mistake? Just not very good at that type of question? Then check out the answers you got right. It’s important to build up your confidence if you can see a marked improvement, but also be honest with yourself if you guessed any of them. For the purposes of practice, you should consider guesses (not educated guesses, though) as incorrect and ask yourself why you needed to guess. Finally, look at the overall test. Did you manage to get through all the questions? Are you answering enough questions to be able to get the score you need? That can help you figure out if you need to be going faster. Focused practice. Once you know what you need to work on, you can do some more focused practice. If you know you’re bad or slow at mental arithmetic, then practice that. Find a bunch of practice questions and keep doing them. Work out shortcuts and strategies. When you feel like you’ve improved, go back and take a full practice test. You should see a big improvement. Make sure you’re not disturbed – While practicing, and also while taking the test itself if it’s online, you’ll want to make sure you aren’t disturbed by friends, family, pets, delivery people, roommates and so on. Not only can responding to distractions take up valuable time, but it can also interrupt your focus and train of thought. Well in advance, make sure everyone who might disturb you knows what you’re doing. Put a note on your door and close it. Turn your phone off or put it on silent in another room. Take care of yourself – It’s amazing how much difference a good sleep and a good breakfast can make to your test performance. Don’t underestimate it. The night before the test, make sure that you get at least 8 hours of sleep and that you have time for a proper breakfast in the morning. It should go without saying, but don’t go out drinking the night before. Even if you aren’t hungover, it will still affect your overall cognitive ability. Focus your practice – Make sure that when you practice you are specific about what needs to be improved. Really great at verbal reasoning but awful at mental arithmetic? Practice those sums. You’ll make the biggest improvements by being honest with yourself about where you need most help. Keep calm – When preparing for any big test, the one thing you can’t prepare for properly is the pressure. It’s useful to practice techniques such as breathing and mindfulness to help you keep calm and reduce stress. There are lots of different ways to help yourself keep calm, so try some with an open mind until you find whatever works for you. Figure out shortcuts – Much of the test is about speed, so it’s important to look out for shortcuts that you can use. For instance, try using a process of elimination with the multiple-choice answers. If a numerical question asks for an average, then you should be able to intuitively tell if a couple of the answers just cannot be right. You can cross those out straight away, which might help you to answer the question as you go without doing the full working every time.